Everyone is vulnerable when calamity or an emergency situation strikes, but it is a doubly challenging experience for children and youth with special needs because of their limitations on mobility. With this in mind, SM Cares, the Corporate Social Responsibility (CSR) arm of SM Prime Holdings, Inc., spearheaded its annual Emergency Preparedness Forum giving special attention to this underserved sector. Among those who attended the forum are Annette Nelmida, a mother of four, and her 17-year-old blind twins Joshua and Jerome. The twins did not let their limitations deter them from pursuing their passions in life, their determination allowing them to be triathletes, to sing, play the piano and even try out photography with assistance. However, the recent Emergency Preparedness Forum made the Nelmida family realize that they also need to equip themselves with information and knowledge in handling emergency situations especially since Jerome and Joshua require visual guidance. Annette expressed her appreciation of the forum, saying that the lecture and the simulation are very helpful especially for her two sons. She says that they finally know what to do during emergency situations. Annette admitted that she finds it difficult to teach her sons about these kinds of situation. The forum did what she could not through the demos and explanations, relating to her sons what she was seeing from the trainers. What made it extra special for the family was when the brothers were chosen to participate in a demo, giving them a better feel of what the trainer was talking about. Prior to attending the forum, the visually impaired twins said that going through emergencies could be quite challenging. They learned the standard “duck, cover and hold” protocol in case of an earthquake. Joshua pointed out, however, that it is extra difficult for him and his brother to find the exit because of their impairment. “Bukod sa exit, mahirap din po kapag maraming tao kasi may possibility na magka-stampede or mawala din po ako,” Jerome added. As a result of attending the forum, the Nelmidas practiced inside their house to familiarize themselves with what must be done when it comes to reaching the nearest exit, being guided by the walls or where one could duck, cover and hold. Engr. 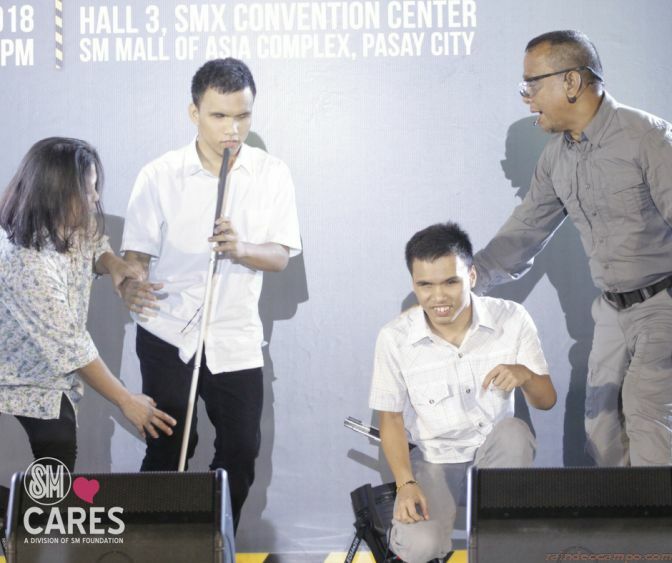 Bien Mateo, senior vice president for Mall Operations and director of SM Cares Program on Persons with Disabilities (PWDs), stressed the importance of holding the Emergency Preparedness Forum annually. “We really have to tap the majority of the people. In the previous years, we focused more on the elderly and people with disabilities. This time, we wanted to concentrate on the youth and children with disabilities. They are the group that is most neglected when it comes to preparation in these [emergency] situations, that’s why we invited experts on different emergencies to teach us, our people and the children also on how to be prepared,” Mateo stated. Among the resource persons at the forum are Lotta Sylwander, country representative of UNICEF Philippines; Dr. Renato Solidum, Jr., Undersecretary for Disaster Risk Reduction of the Department of Science and Technology (DOST) and officer-in-charge of the Philippine Institute of Volcanology and Seismology (PHIVOLCS); and Dr. Ted Esguerra, Operational Medicine Instructor of the International Disaster Response Network. “Typically, in any emergency, 50-60% of those most affected are children. They’re losing their lives because they can’t get out,” Sylwander stated. According to Sylwander, there is an estimated 5.1 million Filipino children with disabilities who are vulnerable to calamities and emergency situations. “These children living with disabilities—hearing, visual, developmental and mobility—all need different [kinds of assistance] during emergencies. They’re often not included in the disaster risk management. This inclusive approach [forum] is a step in the right direction but we need to do more,” Sylwander added. Solidum stressed the importance of disaster preparedness not only for the PWDs but also for everyone in general. “We need to imagine the scenarios, what will happen to us in cases of emergencies like an earthquake so that we can plan and prepare accordingly. Unless we can imagine and unless we feel fear of what can happen to us, we will not act to prepare for any disaster,” Solidum stated. The annual event aims to provide significant information about the reality of a potential earthquake scenario in Metro Manila and equip people in preparing better for disasters and calamities.